Italian philanthropist; born at Acqui Nov. 5, 1830; since 1848 he has been a resident of Alessandria, Piedmont. In 1882 he was elected to the common council and was re-elected for several years. He was likewise a member of the advisory board of the "Ricovero di Mendicità," and the founder of refuges and asylums, and is a director of the Bank of Italy, the Savings Bank, and the Hebrew community, as well as president of the national society for the province of Alessandria. 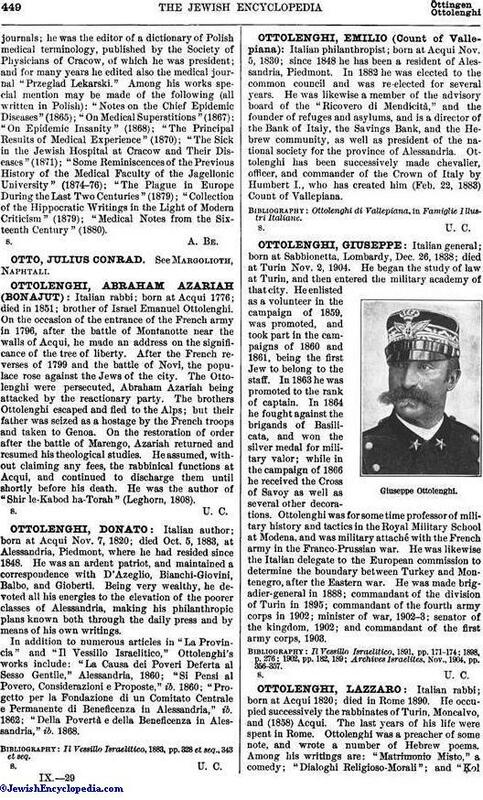 Ottolenghi has been successively made chevalier, officer, and commander of the Crown of Italy by Humbert I., who has created him (Feb. 22, 1883) Count of Vallepiana. Ottolenghi di Vallepiana, in Famiglie Illustri Italiane.